Advair is a prescription drug composed of the active ingredients fluticasone and salmeterol. Fluticasone has anti-inflammatory properties while salmeterol relaxes the airway’s muscles. Used together in Adviar, these treatments are able to ease breathing for patients suffering from asthma attacks and chronic obstructive pulmonary disease (COPD) flair-ups that include emphysema and/or chronic bronchitis. It is manufactured and distributed by GlaxoSmithKline and is not currently available in a generic form, although efforts are being made in that regard. 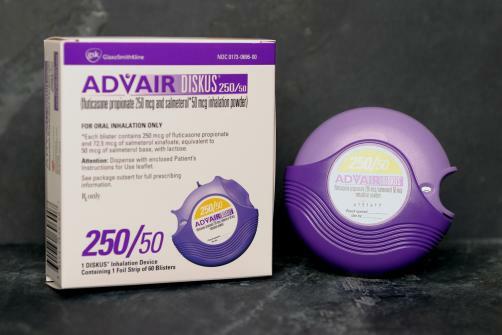 Advair Diskus is available in an inhalation powder in three dosage forms. All three contain 50 mcg of salmeterol. Advair Diskus 100/50 contains 100 mcg fluticasone and 50 mcg salmeterol; Advair Diskus 250/50 contains 250 mcg fluticasone and 50 mcg salmeterol; and Advair Diskus 500/50 contains 500 mcg fluticasone and 50 mcg salmeterol. Advair HFA is used like an inhaler and comes in a single dosing option with 115 mcg fluticasone and 21 mcg salmeterol. 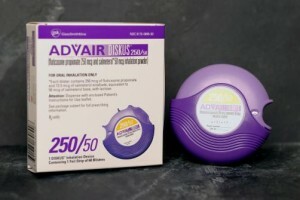 Advair Diskus is a powdered form of the two active ingredients which is held in a plastic inhaler device made up of foil strips with blisters. Each blister contains the standard 50mcg of salmeterol and varying amounts of fluticasone depending on the dosage. Advair Diskus is indicated for asthma and chronic obstructive pulmonary disease (COPD) associated with emphysema and/or chronic bronchitis and is intended to prevent asthma attacks. An Advair inhalation is typically administered twice a day for relief from the symptoms of these diseases. Advair should not be used as an emergency medicine and is not intended to replace a rescue inhaler for patients with asthma and COPD. It is a treatment for long term discomfort only and is not intended for use with sudden, severe symptoms. Patients should keep a rescue inhaler on hand at all times while taking Advair to treat immediate shortness of breath. The effects of Advair starts within 30 to 60 minutes after taking the drug and can last until 12 hours. It is generally prescribed to patients whose asthma symptoms are not easily managed by other short acting inhalers. Your healthcare provider may also prescribe Advair for other purposes not discuss in this medication guide. Advair contains two active ingredients that work uniquely. Fluticasone is a corticosteroid that works by inhibiting the production of substances that cause inflammation. Meanwhile, salmeterol, a bronchodilator, works by relaxing the muscles in the air passages causing it to open up. Their combined actions help open airways and improve breathing in people with asthma and COPD. Take note that Advair is meant for long-term relief of and not for immediate relief in case of emergency. There are other fast-acting medications used for acute attacks of asthma. Read your prescription label carefully and take this medication exactly as prescribed. Do not take more than the prescribed amount and for longer than the recommended duration. Advair Diskus comes with patient instructions. Read and follow the directions for safe and effective use of the inhaler device. Advair Diskus is supplied in powder form and comes with a special inhaler device. The inhaler device is pre-loaded with blister packs that contain specific doses of the medicine. Every time you press on the device, it opens and loads a blister. There is no need to use a spacer with this inhaler. Advair HFA is supplied in aerosol form contained in a canister. Use the specific actuator inhaler device for Advair HFA. There is no need to use a spacer with this device. Shake the inhaler for at least 5 seconds before using it. Gargle after each use of Advair to prevent yeast infection in the mouth. Do not stop taking this medication to avoid unpleasant withdrawal symptoms. Your healthcare provider may wean you off the drug slowly before stopping it completely. Although rarely reported, Advair may increase the risk of asthma-related death. Be sure to use this medication exactly as prescribed by your doctor. Follow the patient instructions for safe and effective use. Discuss with your healthcare provider individual risks and benefits of Advair. Inform your healthcare provider about any drug or food allergy, high blood pressure, heart disease, a seizure disorder, weak immune system, an infection, glaucoma, diabetes, osteoporosis, tuberculosis, liver disease, or thyroid disease. If you think your asthma medications do not seem to work well or if you need to take more than the prescribed amount, seek medical attention. If you are using a peak flow meter and notice that your numbers become low, talk with your healthcare provider. Take all your medications and follow the recommended treatment regimen. Contact your healthcare provider if your medications become less effective. Do not adjust your dose unless specifically instructed by your doctor. The prescription medicine Spiriva is a brand of the generic drug Tiotropium and belongs to a group of medications referred to as antimuscarinics or anticholinergics.